Truly, take a moment to think about this, I’m not rushing you. I really want you to think about it. Have you ever thought about those in other countries who carry barrels of water up to their communities that are engufled in deep or even extreme poverty? Or have you ever thought about how some parents wake up at four in the morning, dress in their culturally traditional clothes, and walk miles, barefoot, to try and sell their country’s knick-knacks in the hot, crowded streets just to make enough to put the bare minimum amount of food in their children’s mouths? Well, on the trip that I took to Peru last week there were many of these women, these strong women, who dealt with the hardships of living in poverty, working ruthless jobs, and supporting a family most likely larger than yours. When people think of Peru, what comes to their mind is almost definitely Machu Picchu, this is what came to my mind too, before I was able to experience what it was really like and how much I had gone my whole life without knowing. Though the culture and history of every single city in that unique country is beyond stunning, and the intelligence of the Incans in incomprehensible, there is so much more to the country than meets the eye. 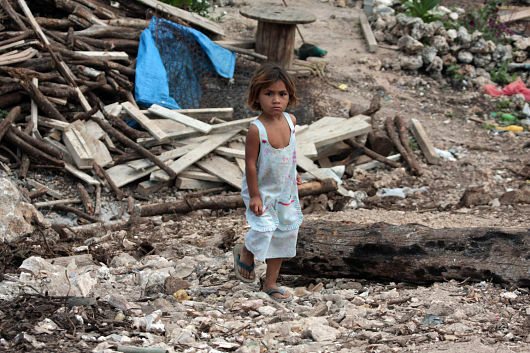 The levels of poverty in the city make Peru the third poorest country in South America, as poverty consumes up to a fifth of the country that hosts up to almost 32 million people. Women sell handicrafts on the street, while men leave their families to work in the mines, in order to help support the ones they love. The houses are made out of makeshift materials all leaning up against each other, and the children bake in the hot sun and swim in puddles when the rainy seasons come, without even a pair of rubber boots to help them. Though many people struggle to live like this, they are okay. They are happy. Their smiles grace their aged faces as they accept you into their community. The meaning of family extends to anyone in the community, and everyone takes care of each other. The happiness is far greater than that you see in the United States, with spoiled children presenting their parents with scowls signifying them not receiving the gift they had wanted. These Peruvians live off of barely enough to get by, but they are happy, while we are here wallowing in our own pity with enough money to share. A great question that merits asking every single day. Thank you for bringing it forward, and I will posit its companion–proactive–question: what more can I do? Thank for writing this piece.